Hamilton County’s location provides perfect positioning for a range of industries. We are welcoming of businesses of all sizes because we understand that a healthy and holistic economy provides opportunities from the upcoming entrepreneur to the family farmer, from the international phosphate mining company to the celebrity chef looking to give back to his hometown. And just as they have found success in our hometown, you can too. Below are just some of the many reasons Florida’s Front Porch can work for you. 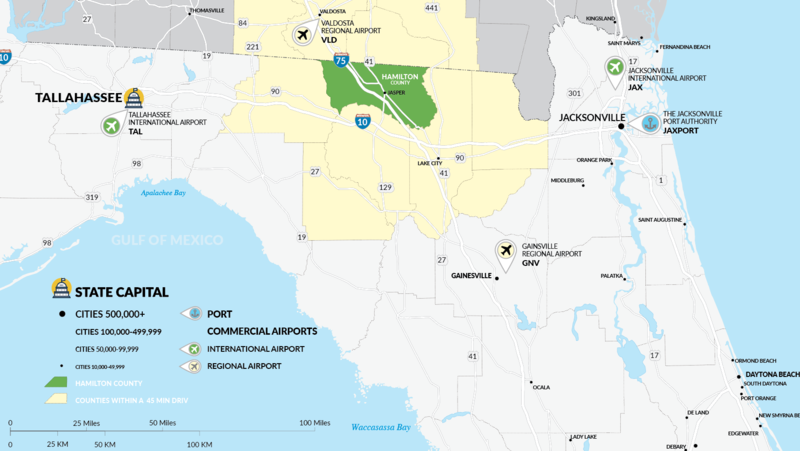 Hamilton County is home to the first three exits in Florida on Interstate 75, near the I-10 corridor, connecting these two primary interstates is a key axis point from the Port of Miami in the South to JaxPort in Jacksonville to the east. This logistical crossroads offers companies a real-time solution to market distribution. The Hamilton County Board of County Commissioners are supportive of the economic development efforts of the Hamilton County Development Authority. Working hand-in-hand, they can help you locate or expand your business in Florida’s Front Porch community. Lake City Gateway Airport (KLCQ) has an 8,003-foot runway which can accommodate nearly any aircraft. The airport has undergone several recent improvements, including an extended taxiway, a new tower and administration building and facility improvements. The Tallahassee International Airport offers a primary commercial carrier in Delta, and is a significant carrier of freight in the region with FedEx and DHL. Jacksonville International Airport, just 75 miles away, is served by 15 major and regional airlines that offer 250 daily flights to and from most major cities in the country and is an international gateway. Florida’s economic development team is strong with assistance provided by Enterprise Florida, the state’s principal economic development organization and CareerSource Florida, the statewide workforce policy and investment board. Together, with the Hamilton County Development Authority, we stand ready to welcome you with the talented workforce, top-ranked infrastructure, global connectivity and quality of life your company needs. Locate in Hamilton County and be welcomed by business-friendly leadership where permitting can be complete in a little as 45 days. Our business-friendly environment extends from the community, to the county to the state level with state regulatory agencies committed to providing quicker, less costly and more predictable permit approvals without reducing environmental standards that make our state and county a great place to live. The Incumbent Worker Training Program is funded by the Federal Workforce Investment Act (WIA) and administered by Workforce Florida. Through this program, Florida is able to provide training to currently employed workers to keep Florida’s workforce competitive in a global economy and to retain existing businesses. Quick Response Training (QRT) is a customer-driven training program designed as an inducement to secure new value-added businesses to Florida as well as provide existing businesses the necessary training for expansion. Through this incentive, Florida is able to effectively retain, expand and attract employers offering high-quality jobs. The program is flexible and structured to respond quickly to meeting business-training objectives. Workforce Florida, Inc., the state’s public-private partnership created to coordinate job training efforts, administers the program. Known as the Road Fund is an incentive tool designed to alleviate transportation problems that adversely impact a specific company’s location or expansion decision. The elimination of the problem must serve as an inducement for a specific company’s location, retention, or expansion project in Florida. A Rural Job Tax Credit is an incentive for eligible businesses located in one of Florida’s 33 rural counties to create new jobs. The tax credit provides for $1,000 per qualified job and can only be taken against either the Florida Corporate Income Tax or the Florida Sales and Use Tax. Five million dollars of tax credits may be approved in a calendar year. These tax credits are provided to encourage meaningful employment opportunities that will improve the quality of life those employed and to encourage economic expansion of new and existing businesses in rural areas of Florida.